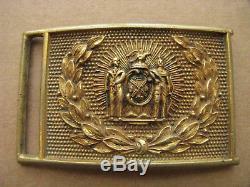 An original Civil War era New York City Police waist belt plate showing the seal of the City of New York surrounded by a wreath. The circa 1860 to 1875- plate is cast brass with applied tongue on reverse measures approx 78 x 51 mm and is similar to, but earlier than the police plate illus in O'Donnell & Campbell's book "American Military Belt Plates" (Plate 714) as this lacks the round depression seen in the back of the later belt plate. The maker has stamped the number 356 in the reverse loop to match the belt keeper. The brass plate retains approx 85% of it's gold was finish. The plate is VG and a rare early NY City Civil War Police item. General Orders and other imprints. All items are unconditionally guaranteed to be authentic and in the condition as described. PLEASE READ DETAILS OF THE ITEM DESCRIPTION. I TRY TO DESCRIBE ALL ITEMS ACCURATELY. The item "CIVIL WAR POLICEMAN NEW YORK CITY WAIST BELT PLATE" is in sale since Sunday, June 24, 2018. 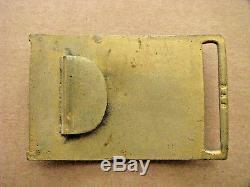 This item is in the category "Collectibles\Historical Memorabilia\Police\Belts & Belt Buckles". The seller is "99counties" and is located in Winterville, North Carolina. This item can be shipped to United States, Canada, Mexico.